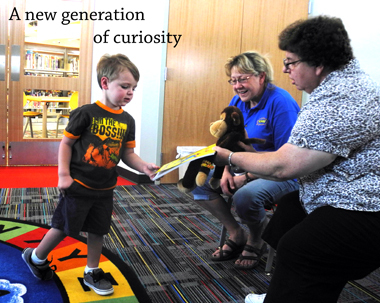 Above, 3-year-old Andrew Mays comes forward to receive the “Curious George” book he won from volunteer readers Carol Focken, right, and Tracy Isgitt Wednesday afternoon during the Artesia Public Library’s Curious George Day. 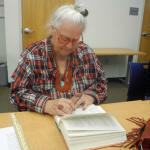 The event, held in honor of author H.A. Rey’s birthday, featured a Story Time and craft. 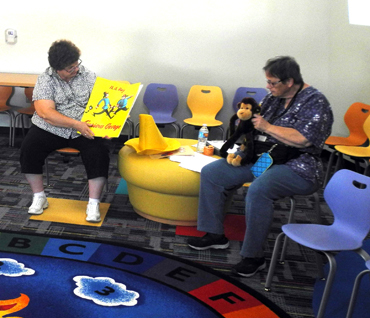 At left, Focken and Children’s Services Librarian Geri Dosalua read to children in attendance. The library will celebrate another famed children’s author’s birthday – Stan Berenstain, who, along with wife Jan Berenstain, wrote “The Berenstain Bears” series – with a story and craft at 1:30 p.m. Tuesday, Sept. 29.